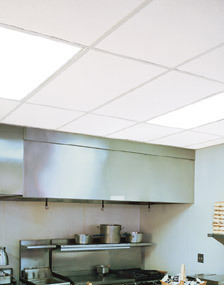 NCI supplies a collection of ceiling tiles suited for a variety of applications and environments such as cleanrooms, hospitals, restaurants, food preparation areas, laboratory, and even photo processing spaces. Our ceiling tiles are formaldehyde free, designed for optimum sanitary conditions, and sealed to prevent particle contamination. Many of our ceiling tiles are suitable for class 100,000 (ISO 8) to class 100 (ISO 5) cleanroom environments, food preparation areas, laboratories and photo processing. These tiles meet the corresponding federal sanitary requirements. Our ceiling tiles come in 24” x 24” or 24” x 48” sizes and are made of vinyl faced gypsum or mineral fiber. Gypsum tiles are ½” thick while mineral fiber tiles have a 5/8” thickness. Some of our tiles are mineral fiber ceiling panels, composed of up to forty six percent recycled materials. The tiles’ white vinyl finish is durable, stain resistant, and easy to clean. Certain varieties of our ceiling tiles are also highly light reflective and noise reducing making them ideal for a multitude of critical environments. Both standard weight and light weight ceiling tiles are offered. The weight of the light weight tile is equal to that of a standard acoustical ceiling tile and is ideally suited for retrofitting an existing 1" office grid into a cleanroom ceiling system. All of our ceiling tiles are designed and crafted to be very long lasting and resist sagging. It is also safe to wash and scrub the ceiling tiles as needed. NCI also provides the equipment and accessories necessary to install and maintain your critical environment’s ceiling. Among these accessories are ceiling tile sealant, ceiling tape, ceiling gasketing, and adjustable ceiling tile clips. Incorporating these tools into your ceiling tile installation will ensure a secure and dependable fit. Please contact an NCI representative for assistance in selecting the ceiling tiles and supplies most appropriate for your critical environment.